The original heritage listed “Welcome to North Sydney” archway and illuminated sign was constructed in 1935 and removed in July 2006. We have been privileged to be commissioned to manufacture and install this iconic pylon sign, bringing it back to life in the form it was immediately prior to its removal. The reinforced concrete legs were transported separately, requiring road closures as each leg weighed 20 ton. These were placed in position prior to the archway pieces being transported to site. The galvanised steel supporting frame was clad in aluminium and wet sprayed with 2 pack paint in the required heritage colours. 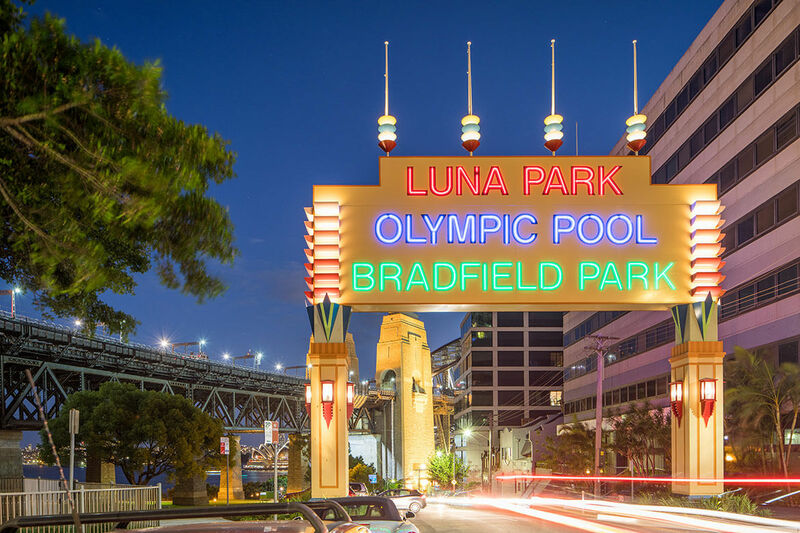 This iconic architectural entry statement was illuminated with LED neon flex which compared to traditional neon is more durable, flexible and energy efficient. At Albert Smith Signs we routinely design, manufacture and install ground-breaking identity solutions that push the boundaries of what people expect from signage and branding. Needing innovative architectural identity solutions designed, manufactured and installed with expertise? We can deliver!